Thumb Ligament Injuries Handout | Dr. Thomas Trumble, M.D. 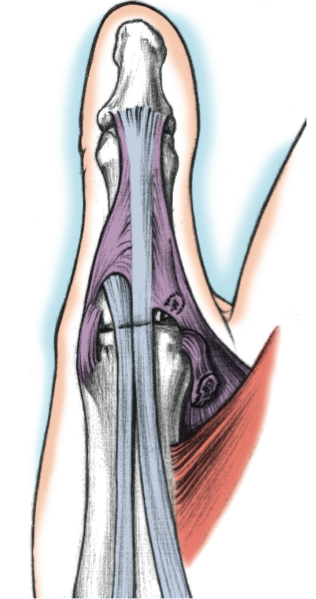 It is a rupture of one of key ligament that helps stabilize the thumb during pinch activities (Figure 1). The injury often occurs with the ligament pulling off of fleck of bone; although the majority of cases occur without any fracture (Figure 2). The patients usually have a history of having a recent fall. Classically during skiing, the glove or mitten allows the thumb to be easily separated from the other fingers, therefore a fall in the snow may cause the thumb to be suddenly deviated away from the rest of the hand, stretching or rupturing a ligament. Frequently, there is some bruising that occurs where the ligament has been ruptured, as well as a diffuse swelling to the thumb. 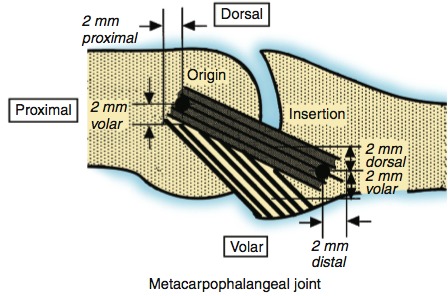 This ligament travels from the head or neck region of the thumb metacarpal and is attached to the base of the proximal phalanx (Figure 3). This is a key ligament which helps to stabilize the thumb when the thumb is pressed against the index finger for pinch activities. How do we diagnose Collateral Ligament Injuries? 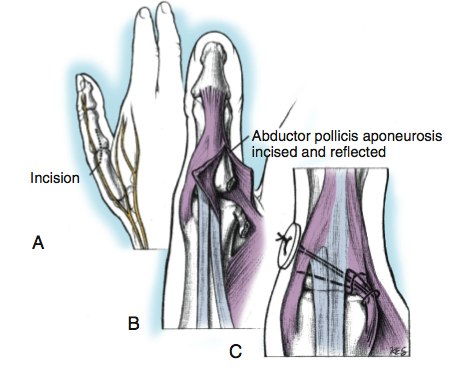 Clinical examination with instability and swelling of the thumb is a key characteristic. This is easiest determined early after the injury. Once the injury has started to consolidate more than a week after the injury, it can be more difficult to make the diagnosis. X-rays are helpful particularly if there has been a small bone fragment to identify the location of the ligament. In late cases, an MRI or an arthrogram obtained by injecting a small amount of dye into the joint can be very helpful in confirming the diagnosis. Who has Ulnar Collateral Ligament Injuries? This can happen to nearly any individual. They are more common during athletic activities. These ligament injuries are rare in children who are still growing with open growth plates, but are quite common in teenagers once the growth plates begin to close. How do we treat UCL Injuries? Partial injuries—where the ligament is not completely separated from the bone—can be treated by splinting for a period of six weeks. This can be done with a hard cast for individuals going back to contact sports, or a removal of the brace for most other patients. In these patients, the MRI or arthrogram has determined that the ligament has not completely ruptured and the clinical examination shows that the joint is stable. Even with the cast or splint treatment, therapy is helpful for several weeks once the splints are discontinued to regain thumb motion. Stiffness is a key problem after these important ligament injuries and can be improved with hand therapy. In patients who have a complete rupture of the ligament, surgery is indicated in order to obtain a good functional result. The ligament must be retrieved from where it has retracted and reattached to bone. There are a variety of techniques to do this. One of our preferred techniques is to either pass the sutures through the bone or use a small bone anchor. (Figure 4A-C). There is a key nerve that travels over this region that is a branch of the radial nerve and it is important to protect this. It is common to have some slight numbness in the region of the thumb after the surgery, but permanent numbness is extremely rare. (Figure 5A-D). Cast or splints are used for six weeks after the surgery. Sutures are removed in 10 days. Typically hand therapy is very helpful in regaining the motion. Hand therapy can be started fairly early in recovery process and usually continues for at least four weeks following the discontinuance of splints or casts.